I made my first foray into Lenoir a few years ago while venturing along the stretch of U.S. 321 known as “20 Miles of Furniture” in search of a sofa. This drive between Hickory and Lenoir is dotted with some 40 home décor stores and outlets—evidence of North Carolina’s heyday as a furniture manufacturing capital. While I didn’t find the perfect couch that day, I did take time to explore this foothills town. Here, you won’t come across a legion of cafés or a bevy of high-end boutiques. But you will discover a downtown dotted with sculptures (thanks to a dedicated arts council), a thriving farmer’s market, a popular outfitters, and a host of community festivals—all signatures of Lenoir’s just-enough-of-everything appeal. Lenoir’s central square is the stage for everything from Friday After Five concerts during the summer and early fall to Cruise-Ins, when classic-car enthusiasts park their sparkling automobiles of bygone eras along West Avenue and Main Street. The motor-heads trade shop talk while a music-and-barbecue social carries on around them. There are also Fabulous Family Films, nights when movies are shown for free on an inflated screen. About dusk on August 8, find a seat for Bolt, or catch Wall-E on August 22. The Bluegrass Farmer’s Market, held at HogWaller Outfitters’ stage [117 Main St., (828) 759-1601], blends two mountain traditions on Fridays from 4 to 8 p.m., spring through fall. You can shop for locally grown produce, flowers, fresh herbs, and honey while listening to musicians play. The concerts are recorded for The Bluegrass Station 1080 AM WKGX. If you venture into the outfitters—lured by the smell of cinnamon almonds roasting in a German kettle—you’ll find camping and sports gear, a wealth of skateboard equipment, toys, as well as stuffed animal heaven. It’s a great place to stock up on Burt’s Bees lip balm and sunscreen before heading to Wilson Creek [Visitors Center, 7805 Brown Mountain Beach Rd., Collettsville, (828) 759-0005], a state-designated Wild and Scenic River in Pisgah National Forest, with camping, mountain biking and hiking trails, and swimming spots. Last year, National Geographic Adventure included Lenoir among the “The Fifty Next Great Adventure Towns,” thanks to this area. Being more of an indoor girl, I stick to shopping at F. Futs and Company (“stuff” spelled backwards) [117 Main St., (828) 759-0075], a collection of small shops selling everything from pet trinkets and costumes to jewelry in the multi-story HogWaller Marketplace. Upstairs, are eight booths filled with antiques. Sister Futs Café is a sandwich shop by day and folk club by night, hosting an open-mics and singer-songwriter concerts. Try the Full Monte Club with pineapple, grilled cheese, kielbasa, or the Yankee (a toasted peanut butter and banana sandwich). Top it off with a Moondae, a sundae made with MoonPies. For home décor, check out Rococo Rionel [814 West Ave., (828) 754-7754], a three-story emporium of accessories, furniture, vases, candles, purses, and other glittery gifts. The shop is housed in one of the oldest retail buildings in the area. The stately structure was built in 1879 and has a secret floor of sorts. Above what seems like the top level, is a half-floor only accessible by a tiny spiral staircase. Don’t miss this little sitting room with a fantastic view of downtown. I follow the aroma of coffee to Java Joe’s, which makes its home in The Wine Cellar and Bistro [128 Main St. N.W., (828) 754-2829], which occupies a corner of the main square. Joe’s puts out a bracing latte, and sells exotic organic and fair-trade beans from massive glass jars. 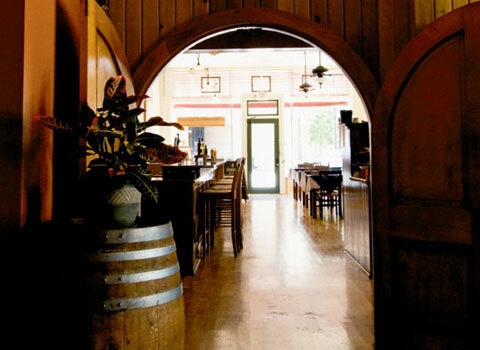 The airy bistro has gleaming wood floors and white linen tablecloths. In the wine shop at the back, I’m happy to find a litany of New World wines and the Austrian Grüner Veltliner that I haven’t seen since my days in Germany. But perhaps the best way to sample a bottle before you buy is to pair a glass of wine with a meal. I recommend the Asian shrimp salad, a sweet, sour, and spicy lunch with sesame ginger shrimp over baby greens with orange-ginger dressing, mandarin slices, and chow mein noodles. Next, I can’t decide between fish tacos or the signature hummus plate, so I order both. The taco is served in a crispy wheat tortilla with Southwestern slaw, and now ranks among my favorite comfort foods. The fresh and light hummus plate with pita wedges and vegetables is a great choice on a warm day when there’s plenty of touring left to do. August is a busy time for the Caldwell County Arts Council [601 College Ave., (828) 754-2486], as the staff and volunteers prepare for the annual Sculpture Celebration it cosponsors with the Tri-State Sculptors Association. In its 24th year, the event takes place September 12 on the lawn of J.E. Broyhill Park downtown. Visitors come to view and purchase pieces from more than 75 artists. As a sign of their commitment to the event, the city and many businesses have already purchased pieces that stand in front of schools, the library, the Chamber of Commerce, the J.E. Broyhill Civic Center, and other locations. Many of these works are by regional sculptors, including Richard Hallier, Bill Brown, James Barnhill, Dan Howachyn, and Stefan Bonitz. The Smithsonian has recognized Caldwell County as having the largest collection of permanent public outdoor sculpture of any county of its population in the United States. Take some artwork home with you—sculpture or otherwise—from Kala, pronounced ka-lay, [526 Mulberry St., (828) 758-5959], a contemporary craft gallery that sells works by 60 artists. Wander through the rooms of this cottage and view the pottery of Hamilton Williams of Valdese, and handmade furniture by local woodworker Jonathan Tucker. There aren’t many bed-and-breakfasts in town, so Rose Noakes’ Irish Rose Bed & Breakfast [1344 Harper Ave. N.W., (828) 758-2323] is the place to check in. Noakes moved to town three years ago, and restored this Colonial Revival-style home built in 1925 by furniture magnate Archie Coffee. With floral bedding and curtains, four-poster beds, and libraries of books, the B&B feels every bit like staying in a private home. It’s just another example of the simple pleasures that come naturally here.